Grimmett became fascinated by artificial radioactivity when it was announced in 1933. He realized that an artificial radioactive isotope might be found to replace radium, and he suggested this in a paper in Nature in 1937 citing radio-sodium as a possibility, but the half-life was too short. But he continued to read the literature. 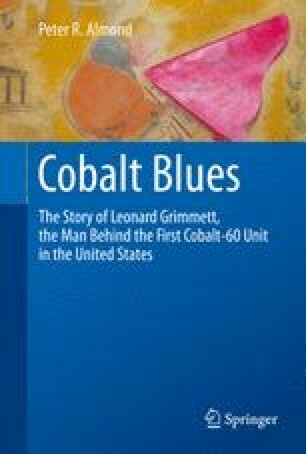 Radioactive cobalt had been discovered in 1935, and several papers appeared over the next few years. By 1942, its main characteristics were known, and Grimmett realized that it was a candidate to replace radium if it could be made in large enough quantities. By 1946, this question was answered by the knowledge that it could be produced in nuclear reactors.